1996: Thomas House tour on tap – 6000 Bees LLC • Homesavers, preservation contractors, consultants • Lafayette, Colo.
At the turn of the century, the 1950s seemed an eon away. A bountiful coal seam running under Lafayette that would become known as the Northern Field was being worked day and night. Coal mining and farming were the careers-of-the-day, and only a handful of farm houses dotted the little-used dirt road west of Lafayette, now Basellne Road, that connected Lafayette to Boulder. There was a time not long ago that the Thomas House and its small grouping of outbuildings — a barn, a silo, a milk house and a granary — stood alone on the plains of eastern Boulder County. For more than 90 years, the Thomas House watched over the changing seasons; the horse-drawn plow that turned the wind-swept grassland; the annual harvest; the giggles of neighborhood children as they visited each Halloween. Lafayette resident Vic Slavec recalls time spent as a youngster playing in cornfields next to the Thomas House. Over the years, the city’s boundaries advanced ever closer to the Thomas’s farm. It was inevitable that new houses be built there, too. Before its relocation last year (1995) to its new home at 513 E. Elm Street in Lafayette, the 96-year-old Thomas House was situated north of Waneka Lake in the Kaufman and Broad development. In the summer of 1994, the City of Lafayette and the Lafayette Historical Society explored moving the house to city property next to Waneka Lake and using it as a farm heritage center, but lack of funds for restoration halted the project. At the time, the city had no historic preservation mechanism, thus the house sat in limbo, being slowly disassembled by dark-of-the-night archltectural scavengers. The house was slated for demolition in January 1995. On a day in early January, I learned the home’s fate from then-councilman Mike Scott. Saving the structure seemed a long shot at the time, but he suggested I give it a try. With the encouragement of Lafayette residents Paul and Grace Roads, Iva Whipple, Jim and Beth Hutchison, Chuck Waneka, Clancy Waneka, Richard Fagre, Lorraine Bateman, Louisville resident Tim Seeber and former Lafayette resident Betty Chronic, the plan to move the Thomas House to a suitable place in old town Lafayette proceeded. The Thomas House has historical significance in that it was where pioneer scion Anna Waneka Thomas raised 11 children, mostly on her own. Its roof peaks and quasi-mansard tower serve as a tribute to the grace and good taste that resided in a rough and ready coal mining town at the turn of the century. The house is named for Anna, who was born in 1855 in Connecticut. According to historian Jim Hutchison, she traveled to Lafayette with her parents in 1861 and married William J. Thomas m 1875. 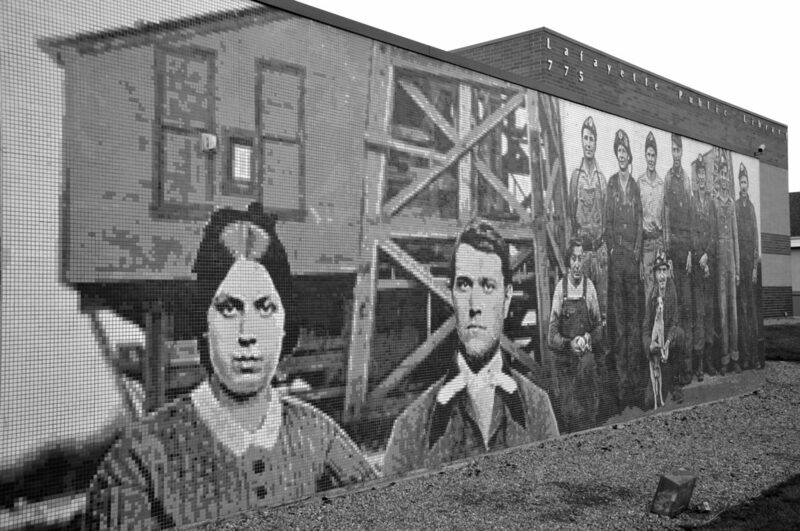 They had nine children on a farm west of town, but in 1895 William was killed mining accident near Ward. Anna married Frank Greenlee in 1899 and had two girls and Frank built the house the grand farm house a few years later. Anna was later divorced from Frank and raised her 11 children in the four-bedroom two-story Victorian. Anna died in 1935. The house underwent major renovation in 1953. The original first-floor double-hung windows,many of them stained glass, were replaced with out-of-scale aluminum sliders and first floor interior walls and trim were removed and replaced with “modern” trim doors and casing. The kitchen was also updated and featured ultra-modem metal cabinets. The house exterior was painted white. That would be one of the last coats of paint the house would see until September 1995. 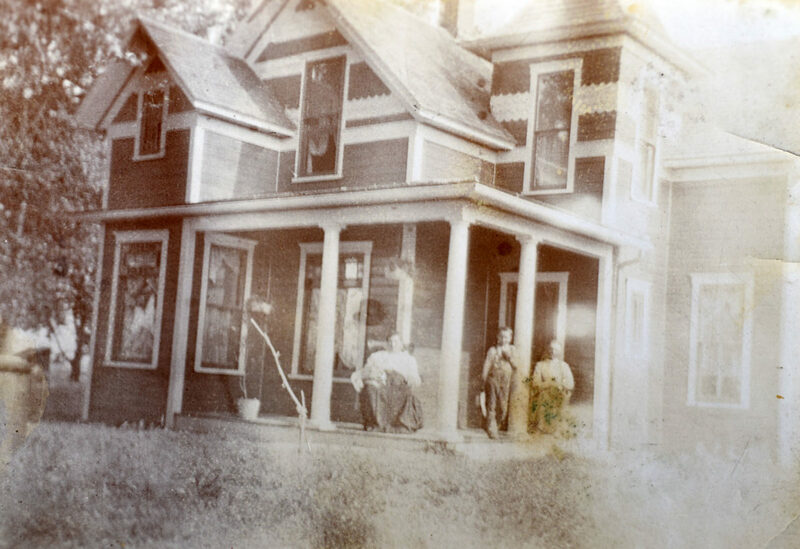 After a 3.5-mile trip through Lafayette’s city streets in March 1995, the home now sits in northeast Lafayette on East Elm Street, adjacent to farmland worked by members of the Waneka family in past years. The site captures some of the home’s rural feel, and dust from the neighborhood’s dirt roads settles once again on the porch steps. My wife, Dana Coffield, and I now live in the home. We’ve worked for the past year and a half renovating the structure to its 1900 appearance. 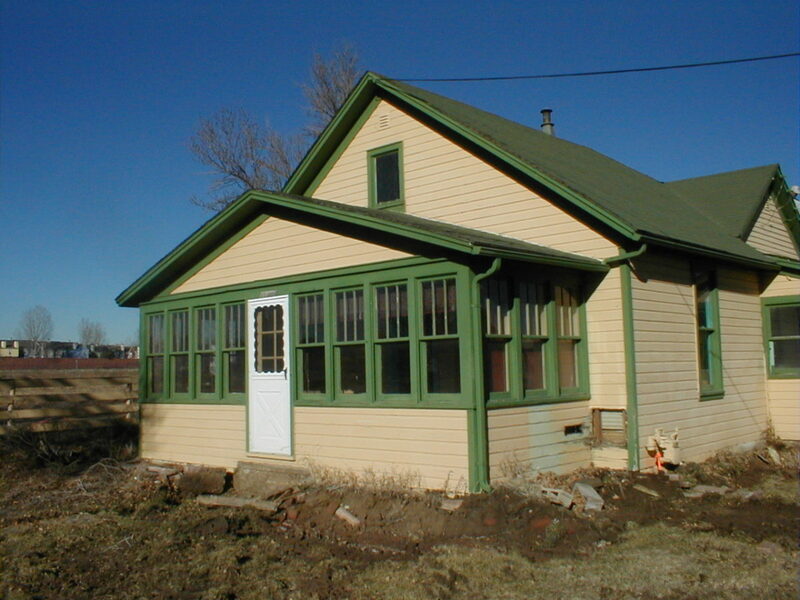 On the exterior, new paint matches the original and new double-hung windows retain the architectural scale. Inside, the first floor was changed slightly to reflect modern day demands, including a bigger kitchen. The upstairs remains the same configuration although all of the plaster and lathe walls were redone with wallboard and trim was replicated by Lafayette woodworker John Murphy to match original. Most of the work on the existing structure is now complete, although a deck off the back and garage on the east side of the house are still to come. 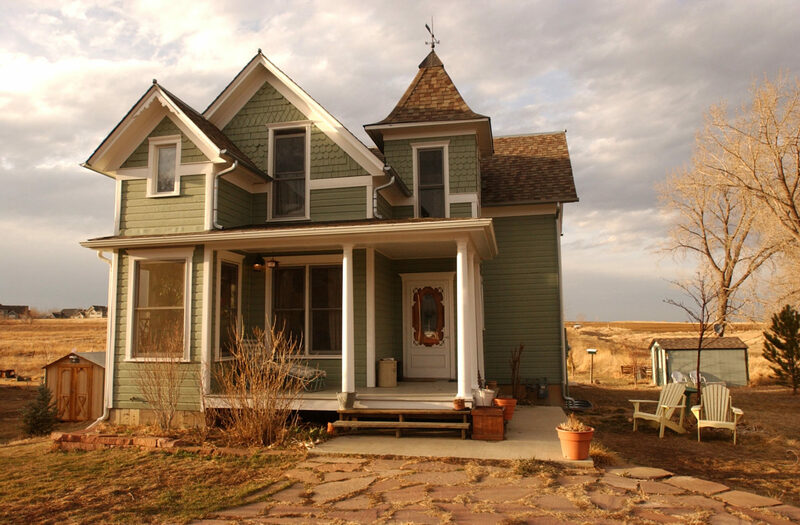 In hopes that the home will stay in its existing condition, a conservation easement was obtained from Historic Boulder, Inc. for the Thomas House. This means that Dana and myself, and any future owners, will have to preserve and tend to the home, and that future renovations will take into account the home’s architecturally unique style. We hope to obtain an historical designation for the house through the newly formed Lafayette historical preservation board. Special thanks go to the many folks who helped with the project to restore the Thomas House. The house was moved by Tom Whitlock of CCI construction of Longmont and balanced expertly 13 feet above the ground while the Firm Foundation crew poured the foundation. Local carpenter John Sajban did a lot of the exterior repairs, including the rebuild of the three-columned front porch. Bill McKee of Longmont, expert earth-mover, has been in charge of grooming almost every speck of dirt on the one-third-acre lot. Ron Kauffman, John Wyss, Bonnie Star, Hans Jorgensen, Michelle Verostko and Karen Westover with the City of Lafayette proved invaluable resources. Thanks to our patient, patient neighbors Roy and Mickey Chavez. I also must thank my family, who have endured and encouraged me through this and four previous home-renovating ventures. And without Dana, Lafayette would have its most extravagant and worst-decorated bachelor pad. I hope some day to raise our children in this home, because it is indeed a home that is blessed by two very noble women. • Doug Conarroe is publisher of the Lafayette News/Louisville Times. The Thomas House is open to the public for tours Saturday (Aug. 24, 1996) from 1 p.m.- 4 p.m. The house is located two blocks north of Baseline, at the corner of East Elm and North Finch.